The Cruiserweight Classic had reached the Quarter Final stage and this episode featured two mouth-watering clashes, as Dragon Gate's Akira Tozawa tangled with CMLL's Gran Metalik and DDT's Kota Ibushi battling WWE veteran The Brian Kendrick. Would WWE be able to up the ante for the stellar Second Round stage? Arguably, the show's main event was the opening match between 4 time CMLL World Welterweight Champion Gran Metalik [Mascara Dorada] and 2 time Open the Triangle Gate Champion Akira Tozawa. In a first time meeting, the duo put on a great encounter, across a mixture of different styles. The pair melded their Mexican and Japanese styles tremendously well, with stunning dives, hard strikes and technical submissions, whilst the final few minutes bought a drop of sports-entertainment drama to proceedings. The narrative unfolded at a satisfying pace, with the duo going toe for toe from start to finish, exchanging periods of offence and using similar routines when doing so. Considering that Tozawa came out of the Dragon Gate dojo, which has more than a tad of a Lucha Libre influence and Metalik has had over 200 matches for NJPW then it really should have come as no surprise that the pair meshed so well. The narrative would reach it's peak, as it should, in the finish, with Tozawa able to kick out of the bridging German suplex that has eliminated FSW's Jack Gallagher and Kenneth Johnson in the second and first round respectively, before escaping a package version of the move and nailing a Metalik Driver [Samoan Driver] to get the three count. The tournament structure had allowed Tozawa to build up his German suplex as a legit finish, which meant it was a hugely convincing false finish, garnering a superb crowd reaction and also giving Metalik the rub having kicked out of it. As part of the storyline it was the natural conclusion to the match, with Metalik proving that his finisher was the deadlier of the two, after the pair fought an even back and forth encounter. Having Tozawa attempt the package German also gives Big Over somewhere to go if he returns to WWE and if that happens a rematch between the two would be a must. Metalik goes on to face either wXw's Zack Sabre Jr. or ICW's Noam Dar in the semi finals in two weeks time. Whilst I think, Metalik v Tozawa should have been the main event because of the international star power, I also felt that The Brian Kendrick and Kota Ibushi managed to one up them. Whilst the previous match melded two styles together, Kendrick v Ibushi made sure the two men's styles were kept completely separate and this presented a wonderful story as the match became less about Kendrick v Ibushi and more about The crafty veteran against the flashy up and comer. It was established early on that Golden Star had the edge on Kendrick in almost every category, hitting a snug roundhouse kick and a beautiful triangle moonsault in the opening exchanges, and from here on in we'd see The Post-Apocalyptic Scavenger pull out a number of sly acts that would keep him the running. Trapping Ibushi's leg in the guard rail as he attempted to get a countout win and hitting a neckbreaker on the apron that bought the 3 time IWGP Junior-Heavyweight Champion's surgically repaired neck across the metal turnbuckle were among the highlights of Kendrick's clever performance. It seemed clear that Ibushi was destined to reach the semi-final, but that certainty was called into question on numerous occasions in the closing stretch of the bout, as Kendrick got a number of tremendously close nears and Ibushi spent plenty of time in the Bully Choke [Grounded Reverse Chinlock], which both men played perfectly through their faces and movement. Twice Ibushi ended up in the hold that's put away Tony Nese and Raul Mendoza, with the second occasion seeing 34 year old DDT star missing a Phoenix Splash directly into the hold, and each time it was equally dramatic with Ibushi selling perfectly before, after and during the hold to get over it's strength and add to that turmoil. Throw into the mix a nasty Burning Hammer near fall for the former TNA X-Division Champion, with Daniel Bryan screaming for Kendrick to get to the cover on commentary and you had more drama than an Eastenders omnibus. 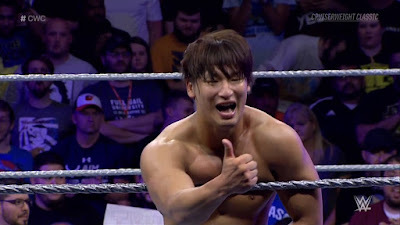 When Ibushi got the win with mid-rope deadlift German suplex and the Golden Star Powerbomb [Elevated Sit-out Powerbomb] to claim the victory, it was a satisfying conclusion to a great contest. Ibushi goes onto a semi-final with EWF's TJ Perkins or WWE's Rich Swann. I wondered whether WWE would be able to lift the quality of the action that was produced across the three Second Round episodes for the Quarter Final and they definitely did, producing the best episode of the Cruiserweight Classic to date. Two very strong match, featuring a variety of action over the show meant that this was a more than satisfactory watch. By this stage you'd expect all four talents to be able to put on great matches and they delivered as Akira Tozawa, Gran Metalik, The Brian Kendrick and Kota Ibushi bought their A-game to help WWE raise the bar for their inaugural international series. With the next episode featuring two equally intriguing bouts as Zack Sabre Jr takes on Noam Dar and TJ Perkins battles Rich Swann, it has to be expected that the penultimate episode of the show will continue the trend.